RALEIGH (WTVD) -- A High Point man and his wife are now millionaires thanks to the Extreme Millions scratch-off game. 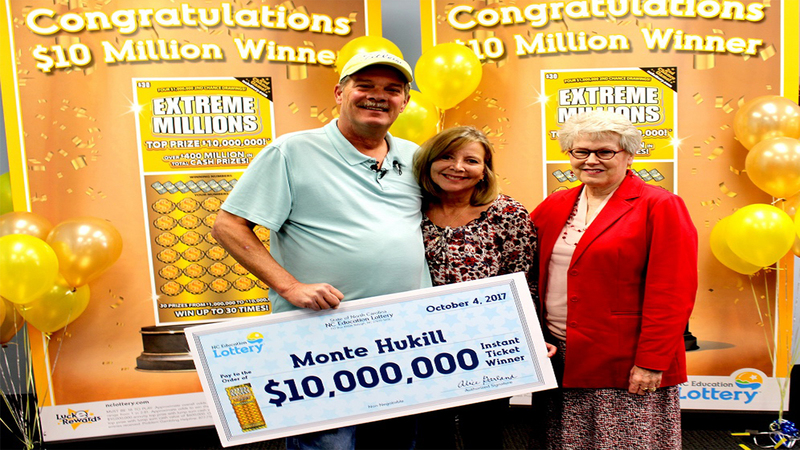 On Tuesday, Marine Corps veteran Monte Hukill stopped by the Fairway One Stop on Greensboro Road in High Point and bought an Extreme Millions scratch-off ticket, before returning home to watch football. Hukill said he was playing the scratch-off while watching the game. "I would scratch a number and then look back at the game," said Hukill. "I wasn't really paying attention. But that sure did change." And it did, once he realized that he had a winner - a $10 million winner! "I walked over to the stairs and yelled, 'Hey honey, you might want to come down here,'" said Hukill while he recalled the moment. After hearing him call, his wife Gage instinctively ran downstairs, thinking something was wrong. My first initial thought was the kids," said Gage, a high school English teacher. "But it wasn't the kids! He showed me this ticket and I just thought, 'No way. Things like this just don't happen to ordinary people like us.'" Putting the lucky ticket on the nightstand, the Hukills tried to sleep through the night. "I think I slept with one eye open," said Hukill. "Because I knew I had won, I just knew it." Excited and nervous, they woke up at 5:00 a.m. and drove to the high school where Gage works so she could finish lesson plans for the day. Then, they headed to Raleigh with the lucky ticket in hand. "The whole ride down I kept telling him to prepare because it might not be real," said Gage. "I can't believe I was such a Debbie Doubter!" Hukill had the choice of taking a $10 million annuity that has 20 payments of $500,000 a year or a lump sum of $6 million. Hukill decided to pick the lump sum and, after required state and federal tax withholdings, took home $4,170,069. He said he plans on using the money to help his two kids pay for college and pay off his wife's student loan debt. "My wife went back to school at 42 to be a high school teacher," Hukill said. "Education is important in our household. So, once we get that settled, then we will think about what to do next." Extreme Millions launched in December 2016 with four $10 million prizes and 22 $1 million prizes. According to lottery officials, three top prizes and 13 $1 million prizes have yet to be claimed.